Why teleportation? Well- The regional fan convention, known as Boskone and held annually in Boston had chosen me as Guest of Honor. Strangely, everyone seemed to expect a speech. I hadn't done any speaking since early college. Worse, the audience was jammed with MIT students. Why teleportation? Because that way none of the MITSFS (MIT Science Fiction Association, pronounced "misfits") could catch me at anything. What with no firm ground for believing that teleportation is even possible, there would be endless room for speculation without any way for some teenage genius to tell me, "You're wrong! Right here in my physics text it says-"
At that, there was enough argument. But the speech went well, even to the point where the question session degenerated into frenzied arguments near the back wall, allowing me to slip quietly away. I'd planned that. But Fred Pohl caught me at the door and asked me to turn the speech into an article for him. Here it is. Any resemblance to the plots of ancient or modern science fiction, novels or short stories, is not coincidence. I've been reading science fiction, voraciously, for eighteen years. In most of what follows, I have borrowed freely from my betters, and even from my own stories. Where I remember my sources, I have quoted them-sometimes. Teleportation is any method of moving from point to point in negligible time. Over short distances we will take lightspeed as negligible. Over longer distances (interplanetary and interstellar) we will require infinite or near-infinite speed. I make a distinction between psychic and mechanical teleportation. Essentially, psi teleportation involves wishing oneself from place to place. In mechanical teleportation he pushes a button. He may do other things first, such as sighting in, charging batteries, weighing and measuring his cargo, whatever it takes. But eventually he will push a button here and he will instantly be there. Similarly, the adept at psi teleportation may have spent decades in spiritual training, learning to negate distance by the power of a wish. These definitions are not meant to be rigorous. Intuitively you know what teleportation is anyway. The history of teleportation is all of the psi variety. Naturally. The prophet Elijah was frequently "transported" by Jahweh. He would rise in the air, spin around a few times, and then vanish. Or he would fly about and come down without vanishing. One day he flew up and up and never did come down. His followers searched the countryside for days. When they couldn't find his body they assumed that Elijah had taken it with him, into Heaven. Friar Joseph of Copertino (1603-1663) was a levitator. Usually in the presence of witnesses, he would go into a religious trance, rise into the air, fly about, eventualy settle on an altar or in a tree. His presence in this article derives from his power of bilocation. Friar Joseph was capable of being in two places at once. Then there are past and present Hindu mystics, and tales of teleportation during seances. No matter. The interesting thing is that, historically, nobody seems to make a distinction between negating distance with a wish, flying by flapping one's arms, flying without flapping one's arms, being in two places at once, or being blown about at terrific speeds by divine or other mysterious forces. The distinction seems to be original with science fiction; it has no basis in recorded "fact". I offer the thought that there may be no distinction; that this confusion may be a fundamental characteristic of psychic teleportation. I'd like to get through this fairly quickly, since I don't believe in psi teleportation, and since my major interest is in the effects of teleportation on society. 1) Consider the following theory: A man in deadly danger would learn to teleport in order to save his life. I can remember two novels in which the idea was crucial: JACK OF EAGLES, by James Blish, and THE STARS MY DESTINATION, by Alfred Bester. The idea is simply to point a gun at a man's head, and fire. One time out of a thousand he will frantically teleport out of the way of the bullet, and you will have a teleport. Forget it. There has been too much opportunity for it! Violent death has occurred since man was definably man. How many have learned to teleport in time to save their lives? Too few to be noticed. But there's another flaw in the theory. Psychic powers are notoriously undependable. Experience says that when the ability to teleport is most needed, that's when it won't show up. 2) My prejudice against teleportation has a valid basis. I haven't seen it in action. Science has existed on Earth for-depending on how you define science-between a couple of centuries and a few millenia. We can't yet build a hardware-type teleport system. But psi powers, if they exist at all, have been around since man was definably human. If teleportation is both possible and useful, we should have been using it since men moved into the Nile Valley. And we would never have given it up...if teleportation is both possible and useful. We conclude either that teleportation is not possible, or that it kills those who possess the gift before they can demonstrate it to anyone. Both are possible. Consider Bester's "Blue Jaunt". A man in a panic, drowning, teleports without considering where he's going. He ends up inside a wall. BOOM! Bad trip. Or, psi could be dangerous in other ways; Genelinked to insanity or to mental deficiency, for example. In any case, psi teleportation is out. But let's ignore facts and do some speculating. What about conservation of energy? What of conservation of momentum? These questions are not idle. Stones did not stop falling when Einstein published a new theory of gravitation. The old laws hold; new laws of physics usually apply only to new areas of observation. Changing one physical law is like trying to eat one peanut. Okay. So what happens if you try to teleport uphill? Does your body get colder, or lose mass? There is a gain in potential energy. It must be compensated by the loss of energy of another form. Suppose I were to teleport to Kerguelen Island? (I am writing in Los Angeles. Opposite me on the Earth's globe is the heart of the Indian Ocean, in which Kerguelen Island is the nearest land mass.) Because of the Earth's spin, Los Angeles and Kerguelen Island are going in opposite directions. Were I to teleport to Kerguelen Island I would have to land running-at half a mile a second. Teleportation can be dangerous. You don't teleport out of a speeding car either. 3) I take another theory of psi teleportation from THE WORLD OF A, by A. E. Van Vogt. It seems that two objects similar to each other, to twenty decimal places will join each other. The lesser will bridge space to contact the greater. This presumed law applies to masses, thought waves, and even whole personalities. In one scene in THE PAWNS OF A, we see Gilbert Gosseyn on one side of. a fence. He wants to be on the other. So he looks at a piece of land just beyond the fence and, with the power of his extraordinary brain, he tunes himself to that piece of land, adjusting his own atomic makeup to a similarity of within twenty decimal places. So he makes the bridge...and half a ton of earth descends on him. We will assume that it is possible for nearly anyone to learn to teleport A new learning technique has been developed. It may be serving DNA or RNA molecules in one's food, tailoring them to carry a superficial memory directly to the brain, as we now feed flatworms to each other to transfer learned responses. It may be something else. What do you get, when nearly everyone on Earth can teleport? Thieves, uncatchable or nearly so, who teleport around the world to follow the night. They never see sunlight. Locked doors, and behind the doors, mazes complex enough to confuse anyone who might try to teleport inside. Otherwise there would be no private property, nor privacy either. Transport vehicles become obsolete. Collectors collect them as period pieces. Intensive, probably productive research into other psi powers (since one has been shown to exist). I object to one thread of Bester's tapestry. If Gully Foyle tries to "jaunt" along a "geodesic curve" he will end by going slower than light. That's how geodesics work in Einsteinian space. But it doesn't affect the pattern of Bester's society, which is worth studying. THEORY OF MECHANICAL TELEPORTATION: Anyone know anything about tunnel diodes? The field is full of good writers named Smith. One wrote a story using a teleportation system based on the tunnel diode effect. Apparently physics students are now taught that a tunnel diode takes an electron here and puts it there without allowing it to occupy the intervening space. If you can do it with quantum physics, why not with larger masses? With people? The theory looks good, and it hasn't been used much in science fiction. Older, more often used, and more traditional is the beaming method. You convert your passenger and/or cargo to electromagnetic waves, fire the beam across space, catch it in a receiver and convert the electromagnetic energy back into matter. A modification is Poul Anderson's system in THE ENEMY STARS. Poul's system records the position and energy state of every subatomic particle in the passenger's body. A side effect is that the body is vaporized, so that one winds up with a complete record of the passenger plus a cloud of superheated plasma. The gas is sucked down through a grid, into a matter reserve, to await the next incoming signal. The record of the passenger is fired across space. A receiver picks it up and uses it, plus the plasma in its own matter reserve, to reconstruct the passenger. I don't know. I wouldn't ride in one of the goddamned things. The engineering problems seem trivial compared to the legal, ethical, and philosophical ramifications. Still, what happens if the signal gets snarled up? In the good old days I read of the possibilities in EC comic books; and the pictures were vivid and horrifying. In practice, the least bit of interference would leave the passenger an idiot or a good imitation of a corpse. Over interplanetary distances you'd have to worry not only about intervening dust and gas, but about red and violet shifts due to gravity and relative velocities. And what happens to your soul? I worry about that. I don't necessarily believe in a soul; I don't believe in taking chances. If my soul isn't recorded somewhere in the process, I'm dead, even though my memory remains as reconstructed electron tracks. Where society is concerned, there are equally serious problems. Let's say we've reached step. one. We've recorded our customer and we now have a record and a ball of ionised plasma. Why not beam the record to two receivers? Now we've got a duplicator. The legalities get sticky. We could get around them by permitting one, say, one Isaac Asimov to a planet; but who gets the royalties on the FOUNDATION trilogy? Similarly, you can keep the record. You fire the signal at the receiver, but you store the tape. Ten years later the passenger walks in front of a bus. You can recreate him from tape, minus ten years of his life. But-aside from questions concerning his soul-can he collect his own life insurance? Suppose we change our mind after step one. We store the tape instead of firing it. Is it kidnapping? Or, in view of the fact that we have mortally vaporized a man, is it murder? Does it cease to be murder if we reconstitute him before the trial? Finally, we assume an advance whereby we needn't destroy the model to get the record. Shouldn't we destroy him anyway? Otherwise he hasn't gone anywhere. Our fourth method doesn't have these difficulties. It is often called tranposition or teletransposition, but that's too much work. Henceforth I'll call it teleportation. It involves making two points in space contiguous... somehow. Generally we take advantage of the fact that the universe, as viewed from four or more dimensions, resembles a crumpled handkerchief. Light follows the contours of the handkerchief, so that spaces which are really contiguous in four or more dimensions do not look contiguous when viewed across apparently fiat space. If the universe does not in fact resemble a crumpled handkerchief, maybe we can make it resemble a crumpled handkerchief. It may be possible to bend the fabric of space by the judicious application of electromagnetic fields, until two points touch. At least we get no embarrassing duplication of passengers. The embarrassment arises if two sets of machines are in operation at once, anywhere in the universe. At best, space will be bent in some unanticipated way, and nobody will get where he wants to go. At worst, the fabric of space comes apart like a too-often crumpled handkerchief. Assume we have a teleportation transmitter and receiver. How we got these is a matter for science fiction; but once we have them we can move onto surer ground. We assume that the principle does not involve beaming; it may involve tunnel diode effects or space-bending or something new. So we've got two enclosed booths. Why booths? Because of an old principle that two bodies cannot occupy the same space at the same time. Like a lot of old principles, this one isn't strictly true. Matter is mostly empty space. There is no reason why you can't teleport into a rock; there's plenty of room for your atoms and the rock's atoms. Trouble is, it'll kill you. Teleporting into a mass of air will kill you too. There are energy factors involved, and also bends, embolisms, etc. Probably there will be an explosion. So you need booths. Naturally the interior spaces are identical in size and shape. The transmitter booth includes air as well as the passenger or cargo. 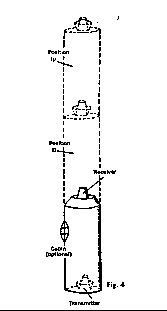 The receiver is evacuated. We teleport the air as well as the passenger and/or cargo. If what we have are transceivers, we need not evacuate the receiver. 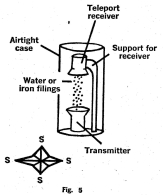 We teleport its air to the transmitter as we teleport the cargo to the receiver. With development, we may be able to do away with the booths. If we expand a spherical force field from a point (GREE stories, from Galaxy) to get a vacuum for the receiver, we need only a transmitter booth. Put the passenger in a pressure suit and we eliminate that booth; it doesn't matter how big a volume gets sent along as long as the volume of the receiver is bigger. But- we'll have to start with booths. Now turn to Figure 1 (page 92). Booths A and B are used for the first stages of experiment, to find out if we can teleport reliably. Once they are working well we move to step II: teleporting instruments from booth C to B and (if transceivers) back again. If conservation of energy holds, we expect a rise in temperature from teleporting down that cliff. Booth D is built on railroad tracks. We set it moving to determine if conservation of momentum holds. Given relativity, we might as well use booth D as receiver only. Thus we can pad the back wall, in case conservation does hold. Booths E and F test for continuous teleportation. Bullets are fired into the opening in E at various speeds. Which bullet will reach F before it strikes the back wall of E? This system could stand redesigning. Obviously we can't pad the back wall of E; we'd only teleport the padding to F. Thus we destroy a teleport booth every time the bullet hits the back wall of E. When the bullet teleports in time, it zings out of booth F and hits the scientist. If the scientist ducks, the coward, the bullet will still destroy booth B. We can get better data with a long crossbow bolt, by measuring what length of the bolt gets teleported in time. But we destroy the booth with the arrowhead and clonk the scientist with the feathered end. I'm sure there's a better way to design this system. Here my theme becomes complex. I intend to demonstrate that any limitations we assume for our teleportation system are going to imply a society: one society for each set of limitations. Again, I will quote my sources where I can remember them, sometimes. But much of what follows is my own. THE ASSUMPTION: We don't need a transmitter. Our teleport receiver will bring anything to itself, from anywhere. Limitations may exist as to distance or mass of cargo. THE RESULT: Thieves capable of stealing anything from anyone in perfect safety. Such machinery was discovered by Seaton, and later by DuQuesne, in THE SKYLARK OF SPACE. In practice, anyone who has such machinery is king of the world. If many men have transmitterless receivers, society falls apart. When society stops making parts for the machines, the machines fall apart, and everything starts over. THE ASSUMPTION: No receiver is needed. Our teleport transmitter will place its cargo anywhere we choose. THE RESULT: We can put a bomb anywhere. The idea was used at least once, in THE PERSON FROM PORLOCK. In practice, a government that owned one of these would-again-own the world. Two such governments would probably bomb each other back to a preteleport level of civilization. Presumably it could happen any number of times. Given the assumptions in (I) and (II) you don't really get a society. You get a short war. Hence most stories assume that teleportation requires both a transmitter and a receiver. Let's do the same. Let us further assume that transmitters (transceivers?) look like telephone booths. You walk into a booth, you put a coin in the slot, you dial. You're elsewhere. How do they work? We assume either space-bending or the tunnel diode effect. We assume the operation is relatively cheap: no more than a few quarters in the slot. Finally, a slug in the slot will send the customer straight to police headquarters. THE RESULT: All present transportation becomes obsolete: cars and trucks and freeways, ships and docks, airliners and airports, trains and train stations. What do we do with a continental net of freeways once the cars and busses have disappeared? You use them for drag races and bicycle riding; you put houses on them or turn them into parks. Or you pack them with cars because there's no place else to put the damn useless cars. Not only freeways and turnpikes, but streets and roads and even sidewalks become obsolete. In business districts you keep the sidewalks for window shopping. The mind boggles. Assume the population problem continues in the direction it's going. Then, as Isaac Asimov has suggested, new generations could grow up without seeing the exterior of any building, including their own homes. There might soon be no countryside to see in any case, and precious few exteriors to buildings. Without need for streets or sidewalks, there would be no- space between buildings; they would be built wall to wall, or in units a mile cubic. And the people get their exercise by riding bicycles between two open booths arranged like E and F in Figure I. But suppose there are limitations on the booths? For each assumed limitation one gets a different society. THE RESULT: Cars, motor scooters, busses will remain. Except for emergencies, nobody would use booths for distances shorter than a transcontinental flight. But airplanes would disappear, except perhaps for cargo flights. Change the price and you change the result. As price goes down, freight traffic by train and truck dwindles, and then. even automobiles begin to go. Raise the price to a few thousand dollars, and only spacecraft disappear. THE ASSUMPTION: The booths are cheap, a couple of bucks a jump, but limited as to distance. Ten miles, let us say, is the upper limit. THE RESULT: A traveler would move in "hops", naturally. But there would come a point where an airplane is cheaper and more convenient, or both, than a succession of teleport booths. Thus, cars would go, but airplanes and shipping would remain. Change the limiting distance and, again, you change the society. At a mile a jump only the cars go. At a thousand miles a jump, only spacecraft remain. THE ASSUMPTION: Teleportation is limited by the Laws of Conservation of energy and Momentum. THE RESULT: Not very different from above. Cars would go, airplanes would remain. By teleportation we could not travel long distance north and south; we would have to do it on short hops. The longer the hop, the harder momentum would jerk the passenger sideways each time. Traveling east, our momentum would lift us a few inches from the chair of the receiver booth on each hop. (Yes, I said chair. You might try it standing up, but I wouldn't.) Traveling west would be worse: momentum would slam you down hard. A New Yorker might prefer to reach San Francisco via the western route, in a line of booths crossing the Atlantic and Pacific Oceans. (Assume a passenger is at the equator, teleporting straight east a distance of X miles. Notice one important exception. We can travel from the northern hemisphere to the southern in perfect comfort, provided the departure point and destination are at corresponding latitudes. Elevators become more important than ever. In Earth's gravitational field, at ground level, we lose-seven degrees Fahrenheit for every mile we teleport upward and we gain as much going downhill. Elevators are more comfortable. So: you want to go skiing in the Swiss Alps, at St. Moritz. From the United States your best bet is to take a plane to someplace with a big landing field, ride an elevator half a mile up to a teleportation booth, then teleport to St. Moritz. Do it any other way and you wind up sick for a couple of days. But from New York you can reach Angol, Chile in one jump! So much for booths. They still look like our best attempt at prophecy; but let's try some wilder ideas and see what we get. THE ASSUMPTION: Open teleport discs. You step on a disc, it teleports you to another disc. Cost, pennies per thousand trips. THE RESULTS: All present transportation disappears. With the proper setup, you can walk anywhere on the planet. Figure 2 is a design for intercity transportation, but it can easily be adapted for longer distances. The blocks shown could be lines of longitude and latitude; their length is optional. 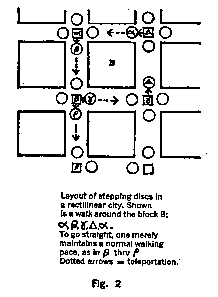 For the rectangular city layout shown, we simply walk in the direction we wish to go. The distance between the receiver plate, at the center of the intersection, and the next transmitter disc is about three paces. In three paces one covers a block, whose length, I repeat, is optional. Perhaps there would be faster lanes through the center of town, and faster still between towns: intersections a mile or ten miles apart. To get out of the system one walks around the final disc and goes window shopping or whatever. The biggest advantage is that we can give up all the endless dialing! THE ASSUMPTION: Our transmitter is hand sized. We can hang it from our belt. It has (oh, well) a telephone-type dial on it. The receiver is bigger: an open platform, either a small plate at home, in vestibule, or a community receiver the size of a public square. Cost is equivalent to the cost of using a telephone. There are (if necessary) compensators for momentum-and heat-transfer in the receiver plates. THE RESULT: Bester's THE STARS MY DESTINATION, with minor changes. No mazes behind the doors; simply unlisted receiver numbers. Shall we design a few spacecraft? Limited teleportation might not make spacecraft obsolete. It might even be used to improve the spacecraft themselves. THE ASSUMPTIONS: Teleportation requires both a transmitter and a receiver. Conservation holds. Teleportation is instantaneous, and does not involve beaming. THE RESULT: See Figure 3. The ship consists mainly of a couple of rocket motors, fuel tanks, and an open-ended teleportation receiver open to the rear. You can leave it open because, in vacuum, you don't need to worry about air getting in the receiver. We use all the fuel except a reserve for steering. The ship coasts. Last through the receiver are the ships designed to collect all this crap. Since they are manned, we had better not send them from Earth. Conservation of energy would freeze the pilots to ice in an instant. Consider the irony: to keep them from freezing, we must ship them from Pluto orbit! It might be more efficient to send through the teleport system only a few ships and another prefab teleport receiver. The rest of the colony comes through the second receiver. In any case, notice four advantages. You don't have to carry the entire cargo, or waste fuel accelerating it. You don't decelerate the ship, so none of your limited fuel supply need be reserved for that purpose. The colonists need not twiddle their thumbs for decades. And the ship can be re-used. Can and will. You just let it coast. Every time it comes near a star system, you have another colony. In eighty thousand years we leave a line of colonies clear across the galaxy, before we finally run out of stars. Less peaceful societies would shove war fleets through the teleport system. It is hard to imagine a safer way to make war. The fleet is strewn all across the system, with all the warships at rest with respect to the universe at large. And how could the target system counterattack? To reach the invading system, they would have to catch a ship which has had years to accelerate to its tremendous velocity, and which is long gone into interstellar space before the attack can even begin. During the Boston speech, a member of the audience suggested that teleportation be used to fuel the above craft. Specifically: the motor is a receiver, Open, with a flared nozzle attached. We drop a transmitter on Jupiter. Presto! Hellishly dense high-pressure gas expands explosively into the vacuum of space, driving the ship forward. Fuel supply: inefficient compared to ion drives or the like, but almost literally unlimited. It won't work. Rather, it won't work for long. Remember, we have assumed that conservation holds. The motor's exhaust velocity is the ship's own limiting velocity if we use teleportation to fuel the ship. Jupiter's atmosphere wouldn't expand fast enough to be useful. Even with a fusion drive, we lose momentum every time a droplet of hydrogen reaches the fuel tank. 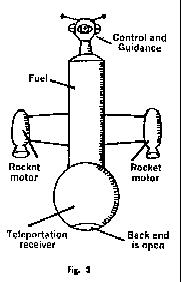 We have to get it back by firing the droplet through the rocket motor. When the two velocities balance... we can't go any faster. THE ASSUMPTIONS: The distance one can teleport is relatively restricted. The greater the curvature of space-that is, the greater the proximity to a large mass-the shorter is the limiting distance. We will assume that on Earth the limiting distance is two feet; around Mars's orbit, some miles; between stars, a few light minutes. Attempt to send a mass beyond the limiting distance, and it will emerge from the receiver as a fluid or a fine dust. The curvature of space distorts the relationships between atoms too greatly. Again, we assume the conservation laws hold. See Figure 4 (page 103). We'll call this peculiar object the "end-teleport drive," and we'll say that it teleports itself onto its own front end. I invented it many years ago, but I never had the nerve to write a story about it. Notice that if you push the button, the ship teleports onto its own front end; but if you hold the button down, it will teleport repeatedly, in a steady stream of images. One jump brings the ship to position 2; but the moment it begins to occupy position 2 it wants to be at position 3; as that image starts to form the ship wants to be at position 4, et cetera. If teleportation is rapid enough we can use it for transportation. You refuse to believe in my ship? Then think of it as an exercise in speculation. Ridiculous as it may seem, we do get results. 1) Rate-of-travel of the ship is limited only by mechanical difficulties, that is, by the rate of successive teleportation. The end-teleport drive does not affect the ship's kinetic energy. We change only the position. So there is none of this nonsense about relativity. 2) We must assume a mechanical limit on rate-of-travel. Otherwise the ship goes off the edge of the universe. 3) You can take your ffinger off the button. Kinetic energy is teleported along with everything else; and as a perfect image you have free will. 4) The longer the ship is, the faster it will go, with a given rate-of-teleportation. But: the longer the ship is, the greater is the danger of getting too near a large mass. To land on Earth the ship would have to be less than two feet long. In fact, you can't land it anywhere with the end-teleport drive. As with the inertialess drives in Doe Smith's LENSMAN series, you keep an intrinsic velocity which reappears when the drive goes off. To land the ship anywhere you need either inboard auxiliary rockets, or rocket tugs. 5) What happens if something gets in the way of the ship? Good question. Many things definitely will. Light, for example. A light beam crosses interstellar space. Suddenly, for an instant, the end-teleport ship is occupying that space. The ship's walls can't stop it, for the light never encountered the walls. A human eye can stop it if the light reaches that eye in time. Result: everything on the ship is transparent. If we assume that some light will be picked up by the teleportation field and carried along with the ship, then how transparent everything is will depend on two things: the rate of travel, and the distance of an object from the passenger's eye. His hand is nearly opaque. The further wall is nearly invisible, because so much light is being picked up in the space between wall and eye...and dropped between wall and eye. The cabin in Figure 4 is unnecessary unless the ship carries rocket auxiliaries. With the end-teleport drive going, the stars are visible anywhere you look. If the teleportation field will not transport light, the situation becomes more serious. At a useful rate of travel a light beam would have just time to traverse the diameter of a human eye before the eye disappears. So a human eye will still function. But the ship and all its contents, including the passenger, are totally invisible, and each passenger becomes a disembodied viewpoint falling between the stars. Travel even faster, and a light beam may have time to touch the retina without first entering the lens of the eye. Now everything becomes a blur. On arrival the passenger becomes a psychiatric patient. 6) Interstellar dust would also be picked up en route. Most of it could be handled by a tough air conditioning system; but a certain proportion would appear already inside the transitory space occupied by the passenger. Definitely he would need medical attention on arrival. 8) As for meteors and larger bodies... we'll use a trick. Let's say we're going toward the galactic core, i.e. toward Sagitarius. Okay: Before we leave the system, we take our ship to within a few million miles of the Sun, on the Sagitarius side; and we hover. We hover by end-teleporting outward as the Sun's gravity draws us inward. Half an hour of this should give us a respectable intrinsic velocity Sunward. Now we take off toward Sagitarius. So we ram something en route. It can happen. But... it takes energy to make two solid masses occupy the same space. Chances are we cannot teleport into what we've rammed. A fuse blows and the motor stops. That leaves the ship with its intrinsic velocity, which we have built up hugely in a direction opposite to the direction of travel. So the ship backs up at hundreds of miles per second! Even if we ram a planet, our intrinsic velocity is higher than escape velocity, and we're safe. 9) Conservation of energy rears its head once more. The ship becomes fiendishly cold as it leaves the solar system, and body temperature drops simultaneously. The reverse occurs as we enter a system. It's a good thing we built a heavy air conditioning system to get rid of all that dust. We'll need it for temperature control. Why do I persist in assuming that the conservation laws hold? This question caused a series of soapbox speeches, mostly in my defense (thanks, friends), along the back wall of my Boston audience. The assumptions are important, and I'm going to try to justify them. 1) The behavior of the universe does not change. In all known cases the laws of conservation of energy and momentum hold rigorously. Now we use them for prediction. The existence and most of the properties of the neutrino were predicted by use of these and other conservation laws. Later the neutrino itself was detected through judicious use of its own proposed properties. If today's physicists can use conservation to predict ghost particles, I can use- them to predict the behavior of a teleport system. 2) In any case, I'm entitled to make any assumptions I like, if they are internally consistent. This is an exercise in speculation, remember? Speculation starts with assumptions. If you don't like mine, try your own; you might get some interesting results. 3) A passenger teleporting downhill must lose potential energy. Some equivalent gain in energy must appear. But why heat? Good question. I myself generally assume that the energy will appear as a jump in electron orbits. Then the electrons drop back, releasing photons. The photons are absorbed before they reach the passenger's skin, giving heat. But almost any reasonable process will ultimately end in heat. Heat is the most general, most randomized form of energy. Could the released energy appear as neutrinos? That would not give heat. But it would upset some of the obscure parity laws of nuclear physics (thus upsetting Isaac Asimov, Hal Clement, and thousands of reactionary physicists) and it would make uphill teleportation impossible, for the process would have to destroy neutrinos which weren't there in the first place. How about a perpetual motion machine? See Figure 5 (page 107). The idea is to use open transmitter and receiver booths. The cargo, thirty gallous of water, is teleported to the receiver. It immediately pours out into the open transmitter, which teleports it back to the receiver, et cetera. Put a water wheel in the system and we get power. Obviously there's a flaw. If conservation holds, the water freezes pretty quick. Furthermore, thermodynamics says that the energy to run the system will be greater than the maximum energy to be obtained from the continuously falling water. But the system is interesting in other ways. Let's replace the water with a ton of iron filings. That way we can enclose the whole system in a vacuum chamber and stop worrying about atmospheric friction, water evaporation, and freezing of the water. We let the filings fail under gravity until the mass is a black stream, near absolute zero, moving at seven miles per second. That's nineteen minutes of operation. Now we let it go another nineteen minutes. The velocity doubles, and we've let the filings fail the equivalent of twice the distance from infinity to the Earth's surface. In thirty days the mass of the filings has doubled. In sixty days it has quadrupled. Note that while Earth pulls the filings, the filings pull the Earth. Minutely, at first. But the filings aren't really going anywhere, so we have the equivalent of a reactionless drive. Every month the thrust doubles. If we run the system long enough the filings will weigh as much as a star. Obviously we don't want that. Tides! But in its present state, turning off the system would destroy the Earth. So we set up a second receiver at the South Pole. Well, this is where I quit. But try a few postulates yourself, and see what you get.